Following consecutive wins against Miesha Tate, Ronda Rousey and Valentina Shevchenko that have cemented her superstar status, UFC women’s bantamweight champion Amanda Nunes will defend her title for the first time in her home country of Brazil on May 12. 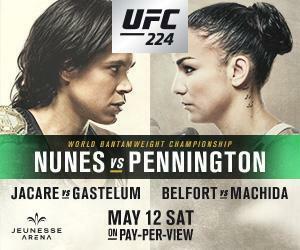 She faces hard-charging contender Raquel Pennington in the main event of UFC 224 at Jeunesse Arena. Plus, a legend makes the walk to the Octagon for the final time, as Vitor Belfort faces fellow MMA icon Lyoto “The Dragon” Machida, and top contenders Jacare Souza and Kelvin Gastelum collide in a pivotal middleweight match-up. Nunes had one of the best years of any UFC fighter ever in 2016. She handled the pressure of being in the main event of the historic UFC 200 by laying waste to Tate from the moment the bout began en route to a first-round submission and the bantamweight championship. She then blitzed Rousey in their fight at UFC 207, ending things in just 48 seconds, and making it clear that Nunes was settling in for a long reign.